Hey there. Sorry to bother you again. Thanks for this template. 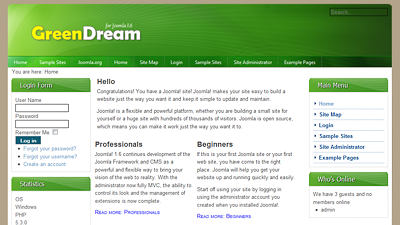 I’m brand new to Joomla and just learning how to use it. Just wanted to point something out to you. I don’t know if I’m doing something wrong or not, but I discovered something, and I wanted to share it. Tell me your URL so that I can take a look. I will let you know, both of you, if I find the problem. Can we change the banner.jpg by a Flash, sir ? If yes, how do we do it ? I am not sure. Search for banner.jpg in the css file and change it to banner.swf. It should work. Hi, I am new to joomla! the template looks great and I have installed to my server to test. But I cannot get it work correctly. Do you have any menual for it? Just check our “Set module positions” page. If I left the menu item on the root pointing to single article it works. What could this be ? i have no idea. It works fine in my demo. Hello, may I “erase” your Copyright (“Design by Joomla 1.6 templates” with Link to themegoat.com) if I pay something for that ? I want to use different colors everywhere / make it look different (won’t look like your original).